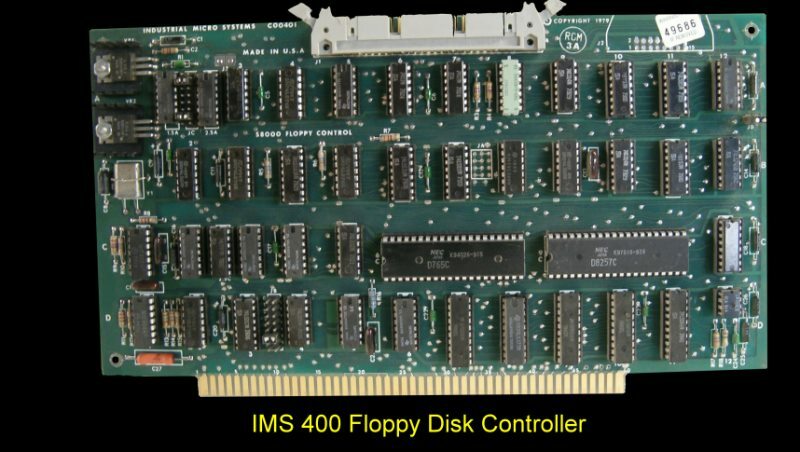 The model 400 and 430 Floppy Disk Controller boards were used in the IMS Series 8000 and 5000 Series systems respectively. The IMS FDC boards used the NEC 765 FDC controller chip rather than the WD 179x series. The boards could be configured to work with 8" or 5" drives in single and double density. An on board 8257 DMA controller provided for fast disk I/O. The board could control up to 4 drives. The 400 series were hardware fixed to I/O ports 80H - 8FH. The closely related 430 board could also be jumpered to I/O ports C0H - CFH. The board could also use the S-100 vectored interrupt lines. The manual for this file can be obtained here.